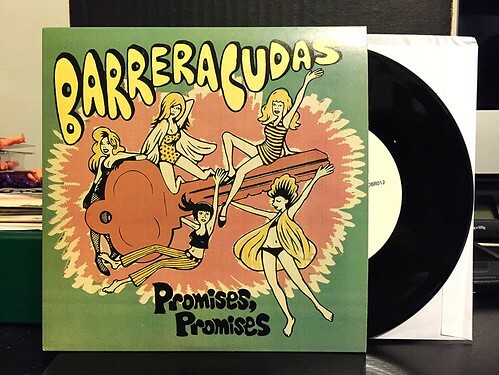 I Buy Way Too Many Records Dot Com: Barreracudas - Promises, Promises 7"
This isn't the most timely of reviews as this 7" was released nearly a year ago, but I finally picked it up when I ordered the new Barreracudas LP that just came out. Barreracudas are another refugee from the Douchemaster records roster. I really miss that label, they had quite the knack for putting out records that I loved. This 7" was meant as a teaser for the band's new full length. The A-Side "Promises" is from the album and is a bouncy, catchy song with a sing along chorus. I don't think that lyrically it's best song I've ever heard from the band, but if they was looking for an early 60's pop throwback they definitely hit the mark. On the flip side is "Young & Dumb." This song is exclusive to the 7" and I actually like it more than "Promises." The verse is built over a three chord guitar riff with a frantically pounded keyboard part in the background. The whole song drops down to vocals and a slower drum beat as the song builds to the chorus. Once that chorus hits though, this song just soars. Really great stuff. As I mentioned, I picked up this 7" when I ordered the band's new album, so I'll be reviewing that pretty soon as well.